Lafayette is suddenly flush with new restaurants and I’m excited! Today I had lunch at Pete’s Diner. I’ve got good and bad to report, so here goes. I try not to be too overly harsh on a restaurant if I visit right after opening, so please take this review with a grain of salt. First, let me start by saying that I tip my hat to anyone who tries to make a go in that location, because it is cursed. Nothing stays there. It’s been so many different restaurants that I can’t even name them all, but there was the Cajun place that everyone seemed to like (I never got the chance to go there), a very short lived Mexican place, Lenehan’s Pub, to name a few. I think there were a few others too. But it seems like nothing lasts long in that location, so good luck to anyone who takes it on! The inside of the place is really nice. It’s been really nicely done, cheerful, but not overwhelming, colors, clean, and lots of staff walking around in matching T-shirts. An aside, I really like a restaurant that puts their staff in uniforms, because it makes it easy to track down people who work there when you need them. I was impressed with the sheer number of tables in there, and even more impressed with the number of people. We got there after 1PM and it was packed! I’ve never gone into that location, at any of it’s previous iterations, and seen it busy. So that’s a really good sign. Pete’s Diner is advertised as a 24 hour diner. This is interesting to me, because I have to wonder if there’s enough interest downtown to justify a 24 hour diner. I think it’s a great concept, but I guess I don’t know enough about the after-hours dynamic of downtown Lafayette to know if it’ll have enough patronage to stay open all night. Time will tell. We were greeted right away and seated and given menus. Our super friendly server appeared right away to take our drink orders and tell us what they were out of. They were out of Coke, Burgers, and Spicy Cajun Potato soup, to start with. Either they didn’t plan for the rush they have, or haven’t figured out how much inventory to order, but no big deal. We all ordered waters and off she went. When she returned with the waters, we all placed our orders. The menu is mostly breakfast, then a handful of sandwiches, and a few entrees and appetizers. The menus are printed on card stock, which I like, because my hope is that means it will change frequently. On the breakfast menu, there are some interesting items listed under the “Omelettes” section, but I happened to notice that it said “Biscuits and Gravy” on the omelette menu. So I asked. And was assured that it was a biscuits and gravy omelette. Our server was very enthusiastic about how good it is. I like enthusiasm in my servers. (Worst line ever from a server, “I don’t know, I don’t eat here.”) She assured me it was great, so I ordered it. I like trying new and interesting things. I had the choice of potatoes to go with it, and since I’m still on a mission to find good home fries, I opted for the country style potatoes (which my server enthusiastically recommended.) It also came with a choice of white or wheat toast. The others at my table ordered a Reuben and a BLT, with mashed potatoes and french fries, respectively. After the server left with orders, we didn’t see her again. I had ordered coffee, and 15 minutes later coffee still hadn’t arrived. I finally flagged someone down (it was handy because they all had matching shirts!) and got my coffee. (Incidentally, they also brought a bowl with about 5 different kinds of creamers. I like having options.) Eventually another server brought out our food. I liked our server, not sure where she disappeared to, but I assume it something important or she’s secretly a superhero and had to go save the day somewhere. 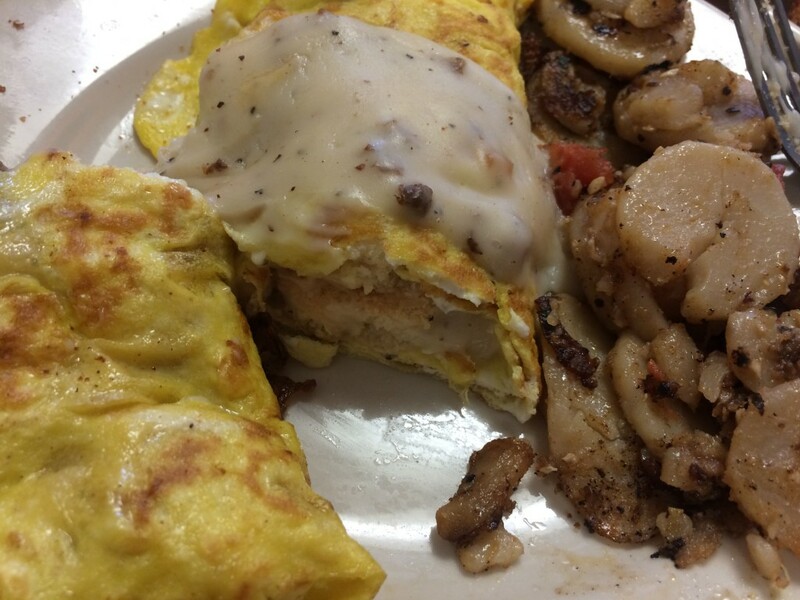 So first, the biscuits and gravy omelette. It was actually less of an omelette and basically biscuits and gravy wrapped in a very large/thin egg. It was more like a biscuit and gravy burrito with an egg tortilla. It was topped with a dollop of gravy. The fried potatoes, as promised, were quite tasty. So thumbs up on the fried potatoes. The biscuits and gravy omelette was okay. I like the concept, unfortunately my biscuit was very hard and stale. The gravy wasn’t that great either. It was just okay. It came with a side of toast which came with no butter. I had to ask for it. My friend ordered a reuben with mashed potatoes. She said the reuben was okay but immediately said how bad the mashed potatoes were. My other friend ordered a BLT with a side of fries. She had no complaints about her meal. After a while of listening to my friend complain about the mashed potatoes, I decided they couldn’t be that bad right? I mean, potatoes are bland, so if you don’t season them enough, then they aren’t going to be that great. So I took a bite. And oh, she was not kidding, those mashed potatoes were awful! The flavor was bad, it went beyond bland, and the texture was bad. My other friend tried them too, and we were all in agreement. Mashed potatoes were really off. I’m not sure what went wrong, but something went very wrong. Our new server came over and asked how our food was, and we couldn’t hold back about how bad the potatoes were. She asked how I liked the biscuits and gravy omelette, and I mentioned that the biscuit was hard. She apologized, and sent my friend some french fries to replace the mashed potatoes. A little while later the owner (who is not named Pete) stopped by our table and apologized for the bad food and gave us all coupons to come back again at 50% off so he could make it right. That’s a huge deal to me. I realize that the food isn’t going to be perfect every time, especially during the first week of opening, so it made a big impact that he made the point to stop by, apologize, and offer us a discount. Afterward, we meandered over to Kathy’s Kandies for a treat, and Kathie said she’d eaten at Pete’s three times already and it had all been great. My hope is that with time, they’ll work out the kinks and become a great place for a meal downtown.